I warn you ahead of time that this is a geeky blog for a limited spectrum of my readers. What? You aren't all bloggers and writers? 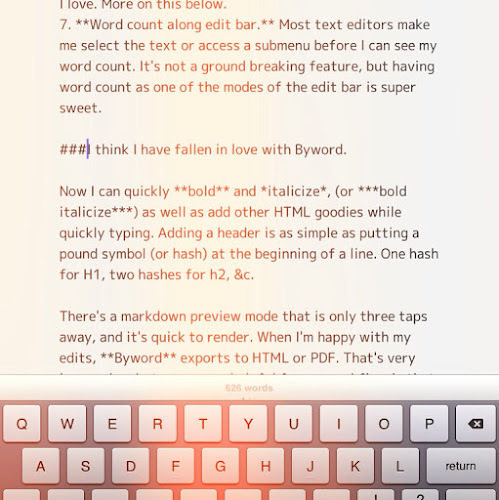 I've discovered a new text editor for the iPhone and iPad that I wanted to share with my fellow writers who have ADHD. It's called Byword. If you don't write for a living you may not appreciate why I am so excited about this app, and since I am writing for a living I need to be quick about today's entry. iCloud sync. There are a lot of text editors out there, but most sync to Dropbox. But if Dropbox were to ever go down, I want an alternative service to work with. Since Byword syncs to iCloud, this allows me to still sync documents between my iPhone & iPad. If I had a Mac that wasn't ancient, I could sync it all to the Mac version of the app as well. Dropbox sync. If iCloud ever goes down, Byword can also sync to Dropbox, which means that my work flow doesn't have to be altered too drastically. Markdown language support. Somebody finally noticed that WYSIWYG editors are slow. Hence markdown language was born. Now I can write quickly with simple codes for bold & italics, etc. instead of using complicated <HTML>bracket</codes>. Clean interface. It's a text editor. There is text. There is an edit bar. That's it. Get busy writing already. Loads quick. 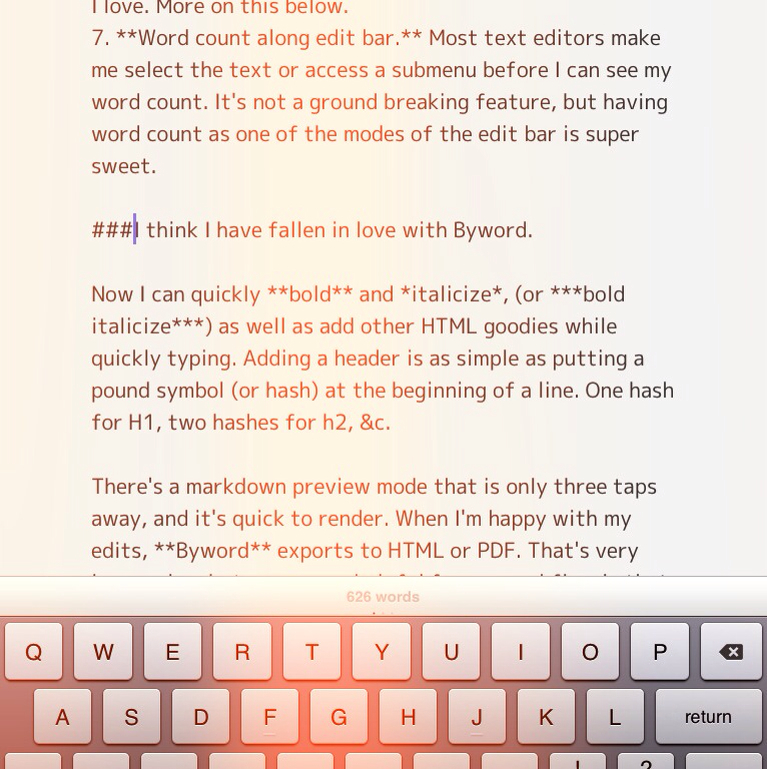 Unlike fancier blog and document editors, Byword launches quickly and lets me get busy working. Exports to HTML & PDF. This is the magical feature I love. More on this below. Word count along edit bar. Most text editors make me select the text or access a submenu before I can see my word count. It's not a ground breaking feature, but having word count as one of the modes of the edit bar is super sweet. I think I have fallen in love with Byword. Now I can bold and italicize, (or bold italicize), text as well as add other HTML goodies while quickly typing. Want something **bold**? Surround the word with asterisks. Need a header? It's as simple as putting a pound symbol (or hash) at the beginning of the line. One hash for H1, two hashes for h2, &c.
There's a markdown preview mode that is only three taps away, and it's quick to render. When I'm happy with my edits, Byword exports to HTML or PDF. I can also export to email as formatted rich text, plain ole text, or attached to a new message as an HTML or PDF file. That's very impressive, but even more helpful for my workflow is that I can copy the text as HTML right to the clipboard. Then I can paste it into Blogsy, add a picture, and whammo! Post a blog. This cuts out so much time. I'm very excited. Byword is a mostly stable app. I've noticed an occasional glitch or two syncing with iCloud that hangs the app. I am not sure if this is due to my iPad being a first gen on iOS5, but I've noticed it on my iPhone running iOS6 as well. Over all, however, this app lets me get busy writing down my thoughts without getting in my way. Since I have ADHD like a dog in a park filled with squirrels, working in an environment that doesn't distract me when I'm jotting down thoughts is very important to me. Byword may not seem too different from other simple interface text editors like PlainText and others, but it is the simplicity in tandem with markdown language and HTML export that makes this app magical for me. It's made for bloggers, copywriters, writers, and students in a hurry. If you do a lot of writing under deadline, Byword is worth a look.